Toronto, ON electro duo Crystal Castles recently revealed that they had tapped the Cure's Robert Smith for an upcoming single. One day after reporting that news, we already have the track up for streaming. On the song, dubbed "Not in Love," Smith's inimitably dramatic vocal delivery is unmistakable as he sings over the Castles' club-ready backbone. The band's contribution to the track is less in-your-face than their usual material, with a clean, rave-ready pop number in place of their usual air-raid noise party. 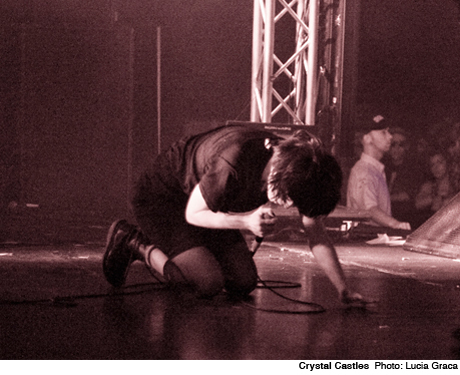 The resulting track is definitely a success, and this might just be Crystal Castles' biggest breakthrough yet. Stream "Not in Love" below courtesy of Some Kind of Awesome. The "Not in Love" single is due out in Canada via Last Gang Records on December 7. UPDATE: Here's a download of the track, which is actually a Platinum Blonde cover. Whoa!